Carolyn Kimber, DPA Secretary General, is quoted in an SC Media article on Age verification proving to be difficult for government to legislate published on 23rd March 2017. The piece can be viewed at: https://www.scmagazineuk.com/age-verification-proving-to-be-difficult-for-government-to-legislate/article/646016/. 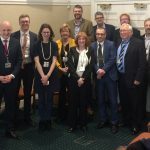 On Tuesday 21st March we held a successful inaugural meeting of the DPA Digital Infrastructure Working Group Chaired by new Parliamentary Chair, Calum Kerr MP. Peter Farmer of Gamma Communication is the new Industry Lead.